Hello, everyone. Like many of you, I am a seasonal decorator. I like to change things up around our home as the seasons change. Last week I was doing some organizing and cleaning in our master bedroom to get it ready for summer. As I was doing some tweaks, I thought a good blog post would be how to fluff a bedroom for summer. Most of my fluffs are pretty obvious, and all of them are simple fixes. This change is probably the most important one since a bed is the biggest piece of furniture in the room. We have a king-sized bed with a padded headboard. Those things all stay the same. But for spring and summer, we switch from the comfy flannel sheets to cotton percale, and we change the heavy comforter to a summer bedspread. After realizing that the bedspread I have been using for a few summers was showing its wear, we sent it to Goodwill and opted for a different look. However, I didn’t have to buy a new one. 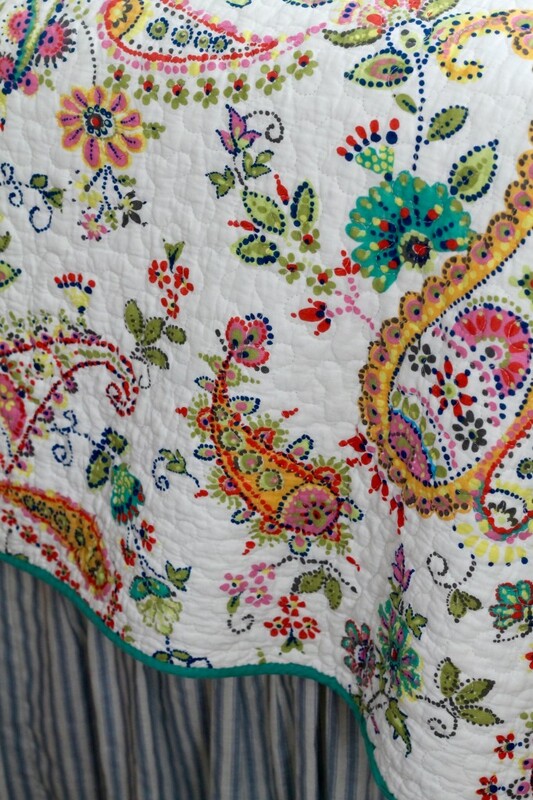 When Jordan and Yankee moved last fall, she gave me the colorful paisley bedspread that she had been using in the guest room for just a few months. It is the right size for our bed, and it has some fun colors that I might not have selected on my own. I love anything paisley almost as much as I love buffalo checks, so accepting this hand-me-down was a no-brainer. Spreading it out on our bed added a welcome burst of energy and color to our room, and I am loving the way it looks. We have plantation shutters on all of our windows, but for some reason, I like to also have curtains in our bedroom. 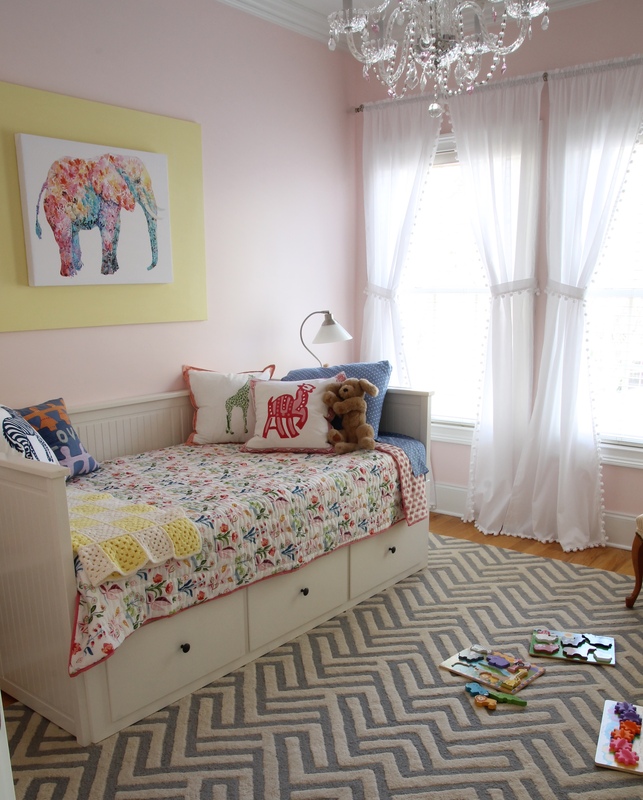 It’s an easy way to soften the look and make the room even more inviting. To lighten things up for spring, I took down the drapes and purchased some white sheers from Country Curtains. They look so breezy and soft. 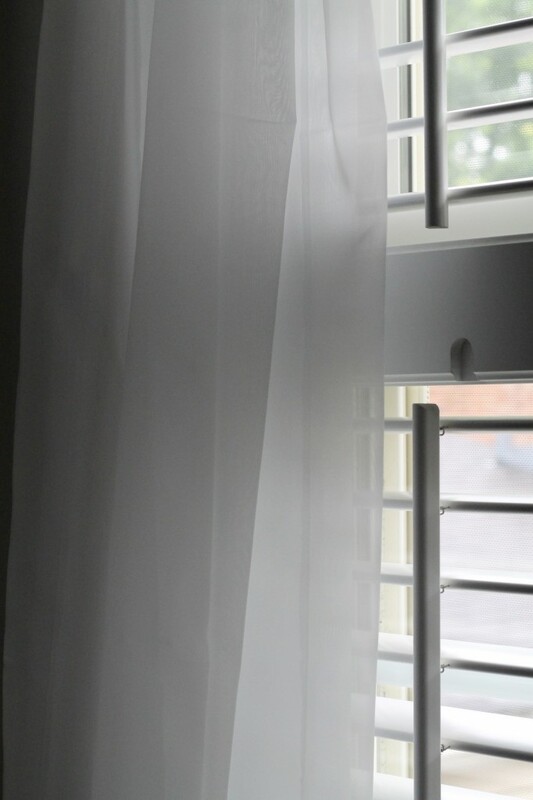 If you have curtains, you can always remove them and leave the windows bare, unless you need the curtains for privacy. We have a love seat in our bedroom that we use for reading and just having a quick conversation. It’s in a neutral color and easy to work with. 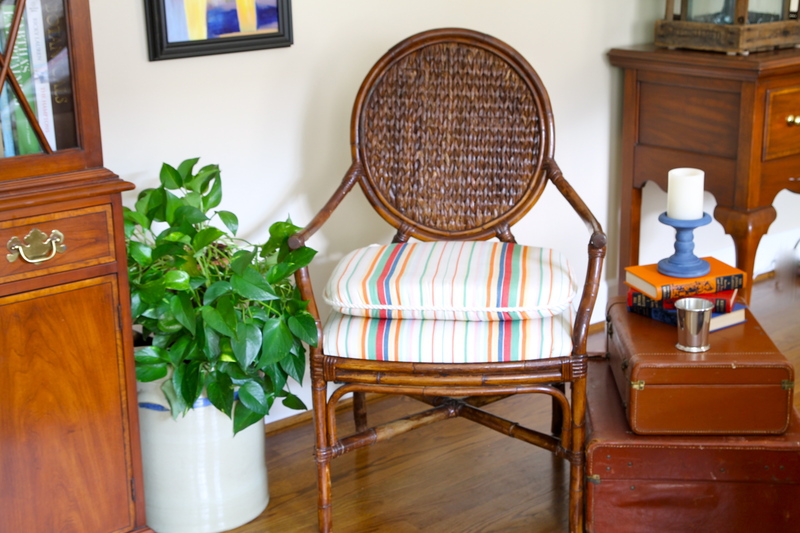 Changing pillows in a room is one of the easiest ways to give it a new look, and that’s just what I did to the loveseat. 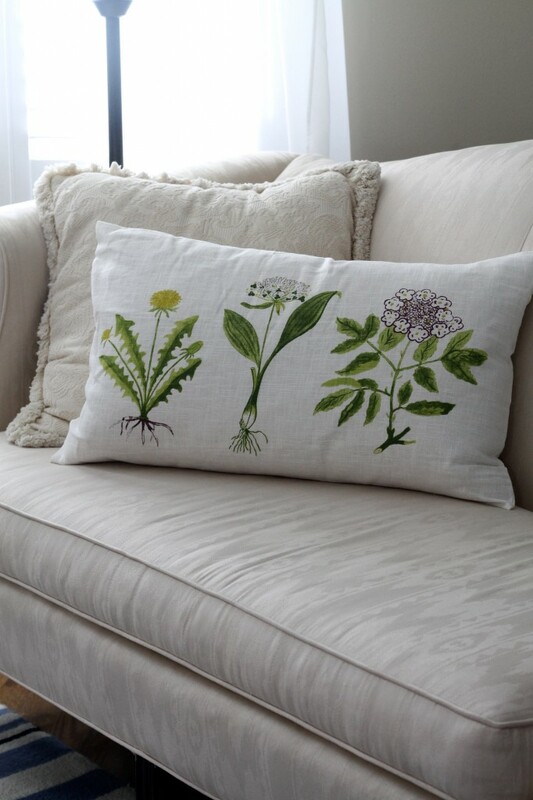 I have been on a pillow-making craze recently, but for the love seat, I just added a pillow that I bought at IKEA in the spring. My plan was to put it in our sun room, but for now, it is at home in the master bedroom. I went to a fashion show a few weeks ago that included a silent auction. I scored an adorable original watercolor. The colors are perfect in our bedroom, and the size was right, too. Removing the existing dark art and adding my new painting was an easy way to prepare the room for summer. 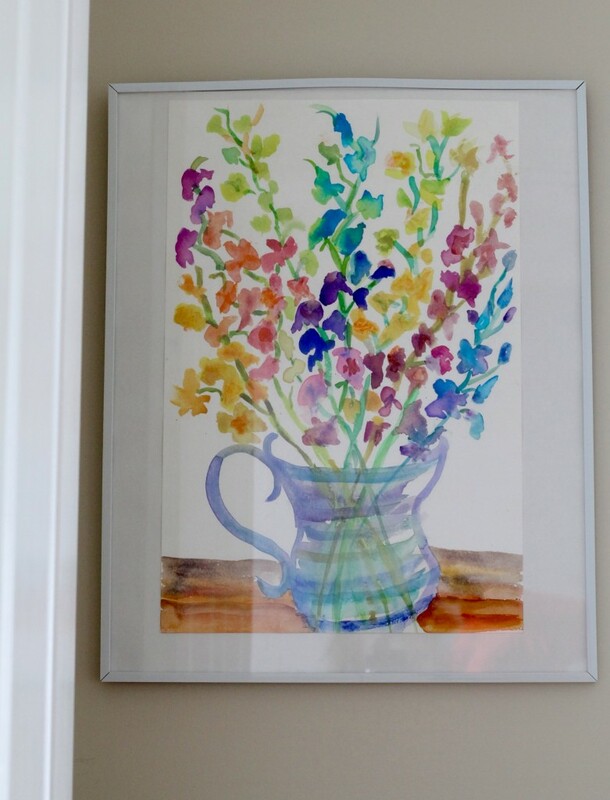 If you don’t want to buy new art, perhaps you could frame some colorful fabric, scrapbook paper, or vintage magazine advertisements. 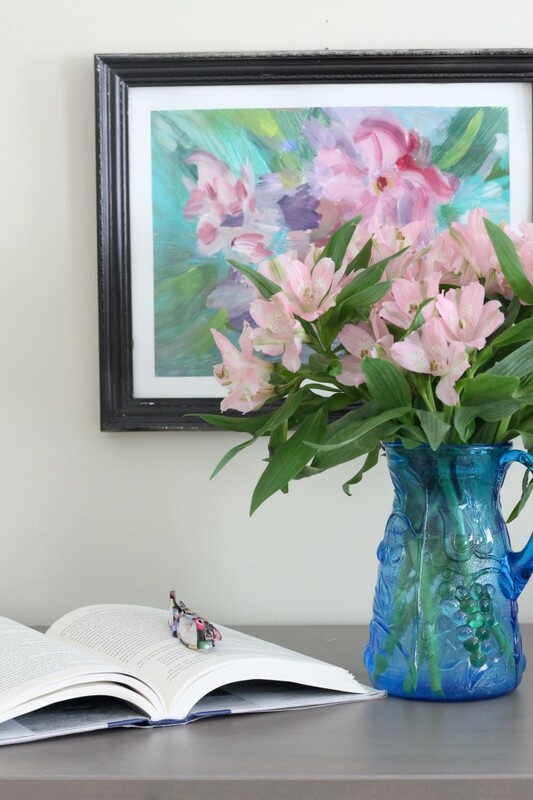 Adding a vase of fresh flowers to a room is probably the simplest thing you can do to lighten the look for spring and summer. We try to have fresh flowers in our bedroom year round. Sometimes they come from the supermarket, and sometimes they are from the annuals blooming in our courtyard. 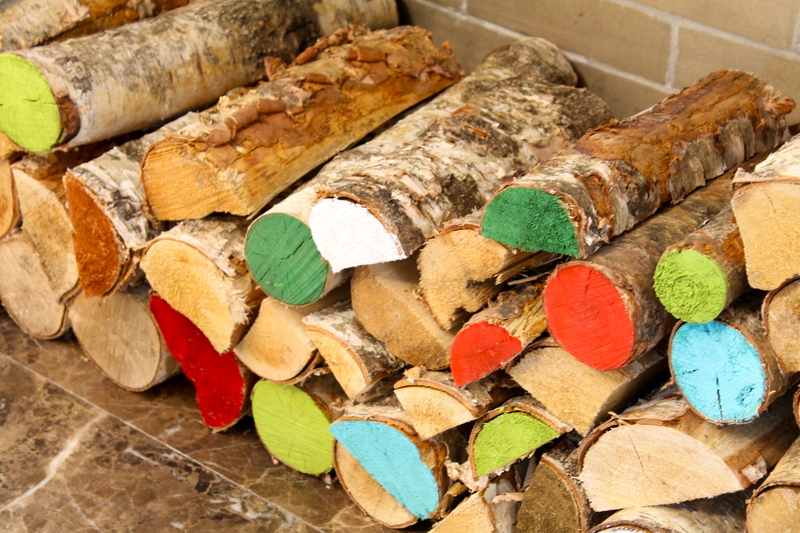 It’s the freshness and the color that will lighten the look of the room. Remember to change the water daily so they will last longer for you. And by the way, it was a total accident that the colors of this particular bunch of flowers sort of mimic the colors in the contemporary painting behind them. I’m sure you probably have some great suggestions to add to our list. We would love to hear what they are. paintings you created by splashing paint onto a “surface” and placing a canvas onto the surface? Would be a great project for the grandchildren visiting from various area of the country. Thanks for the home touches you share with us! Rosalie, we will do another post soon about the painting. I am going to do one for our basement guest/rec room. Show us a picture of the entire bed! Pam, I took the photos in a rush and didn’t have the time to do photos of the entire area.